Often the method of fixturing a sign is the bigger deal than printing the sign itself. 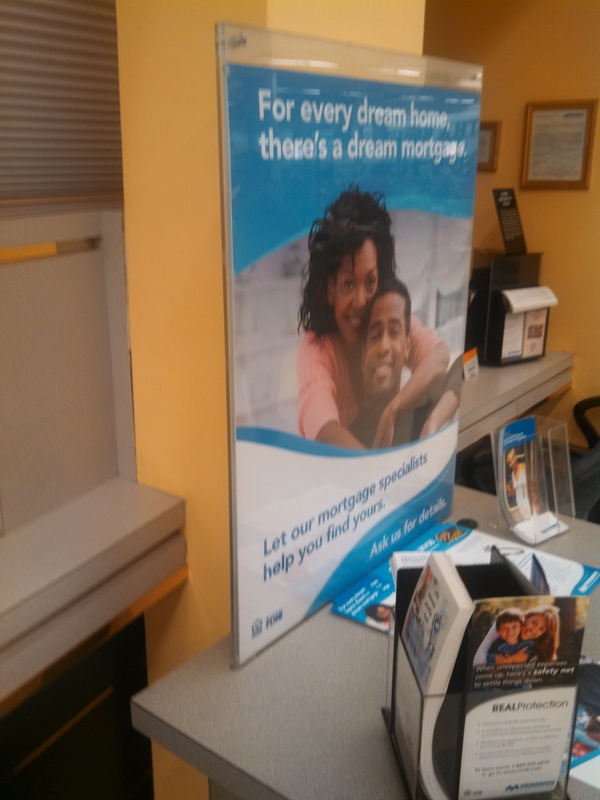 Here’s a creative solution employed by Meredith Village Savings Bank, our good customer. In this case, they wanted to have a good size (22×28″) sign on the counter, but they had no wall to hang it on, and anything standing on the small counter would have been subject to being knocked over by the public. Their solution was to put a slot in the counter top, into which the acrylic holder is inserted. This gives them a stable and durable sign holder. We print their signs on .040 sintra, which is rigid enough to be easily inserted and removed, and stays flatter than paper will over time. This entry was posted in Flatbed printing and tagged bank signs, retail signs, store signs. Bookmark the permalink.